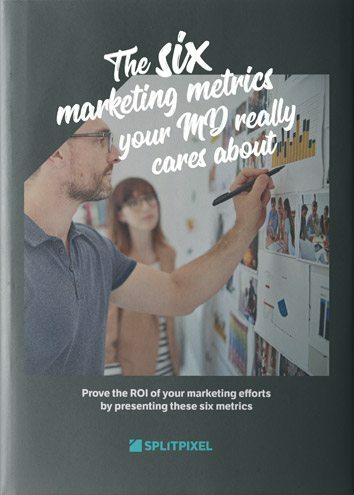 Prove the return on investment of your marketing efforts by monitoring the metrics that matter. 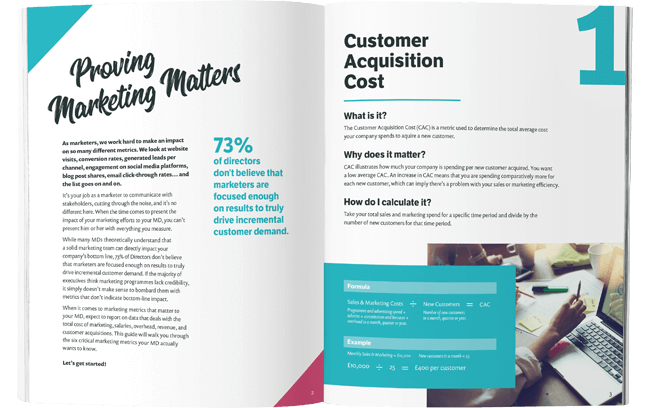 Use our free guide to six essential marketing metrics for proving the value of your marketing activity to decision makers. We've included a bunch of advice on calculating and interpreting these metrics, with illustrative examples. Take a look! One of the biggest challenges for any digital marketer has nothing to do with competition or campaign performance. Often the main hurdle is simply getting your manager, or your director, or whoever controls the budget, on board with your idea. Most digital marketing isn’t a quick win. It’s a process that builds over time, which means it can be hard to sell to senior management. We put together this guide to help with that. Customer acquisition cost (CAC), marketing percentage of CAC, and the radio of lifetime value to CAC. Marketing-influenced and marketing-originated customer percentage. What these metrics mean, why they matter, and how to calculate them. All tailored towards proving the worth of your marketing activity to senior decision makers. Download it for free below! Hi! We’re Splitpixel Creative, a digital agency with 10 years of experience in building marketing and lead generation-centred websites, as well as providing a range of digital marketing services, including SEO, PPC and content marketing. Web designers and developers – we have the creative and technical skills to deliver all areas of a marketing strategy. We set out the formula for calculating these metrics and illustrate with a working example that you can use to explain to your MD. Speaking of, many directors don't believe marketers are focused enough on results. 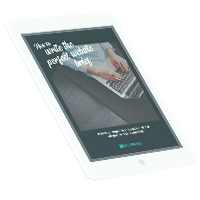 Prove that's not the case with key metrics. Splitpixel have the ability and experience as a digital agency to fulfil our requirements in a way that makes them a proactive and useful addition to our team.